Beautifully expressive Christian statues overlooking visitors entering Notre Dame Cathedral in Paris, France. Here’s an interesting scene overlooking visitors, worshippers and tourists alike, as they enter the stunning Notre Dame Cathedral in Paris. These statues are right above one of the main entrances to the Cathedral but, I suspect, many tourists arriving during the busy summer months might not even notice this group of interested onlookers. Frankly it’s hard to notice as you’re herded, like sheep, into the sacred space that awaits you. To add to the sense of nostalgia I added a subtle warm tone to the image and a gentle glow which intensifies the blacks and adds extra luminosity and a soft, creaminess to the lighter tones in the image. It’s a simple photo, but with a little technique and an understanding of what you want to explore or communicate, it’s amazing what can be achieved. Tourists outside the spectacular Notre Dame Cathedral in Paris, France. One of the problems associated with photographing architectural elements in churches is that they are often at an elevation higher than we mere mortals. The elevated position of the statues causes us to lift our gaze and, as a consequence, to tilt our camera upwards. As a result, particularly when a wide-angle lens is used, the image becomes distorted towards the edges of the frame. You’ll notice this, most commonly, as the bending of what should otherwise be straight vertical lines. A non-technical solution, that doesn’t involve fixing the problem on the desktop, is to move backwards and zoom in. Just continue to move backwards and zoom in until you achieve the desired composition that ensures important vertical lines appear straight. You’ll find that the further back you go the less you’ll need to lift your head or tilt the camera to compose the photo. The idea is to move back far enough for your camera to be parallel to your subject, while still giving you an acceptable composition. By moving backwards (watch you step, or you’ll end up in the drink), it’s as though you’re actually also moving upwards. The further back you go the straighter the vertical lines will appear. Wow! The other advantage of this technique is that, by moving backwards, you’re now more likely to move your lens’s focal length away from wide-angle, where distortion on the edge of the frame is particularly pronounced. For those who prefer the software route applications like Adobe Lightroom, from the folks that also bring you Photoshop, offer a great solution. Just be aware that, as a consequence of re-straightening verticals on the desktop, image cropping will occur. The more straightening that’s required, the more of the image will be cropped by the software. To avoid losing important information within the scene make sure you factor the inevitable cropping into your original composition by including lots of otherwise unwanted areas around your primary subject matter. For folks like me who really enjoy getting their composition right, in camera, this will be a little disconcerting, at first. But you’ll get used to it and, after with a little practice, you’ll realize just what a powerful solution Lightroom can be for your imaging needs. As there’s not a great deal of color on the surface of Notre Dame Cathedral I opted for a black and white rendering of the first group of photos I made after my arrival. After all it was the shapes and textures of the statues, as much as their historical relevance and power over the masses, that interested me. If color isn’t an essential component of your composition consider removing it. You’ll be amazed how prominent one or more of the following elements of composition will often become. 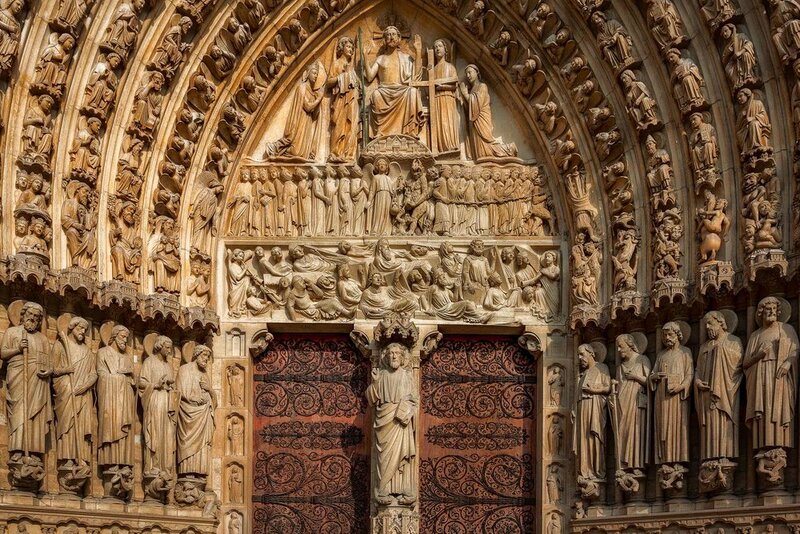 Intricately carved statues, under late afternoon light, frame an entrance to the spectacular Notre Dame Cathedral in Paris, France. After making some photos of the outside of the cathedral I decided to venture inside to explore and photograph the interior of this truly splendid building. By the time I’d exited the cathedral the light had changed and I made use of the softer and warmer late afternoon light. I was fortunate to have had the time to photograph the facade under varying lighting conditions. In fact I returned later that night to photography it again. The advantage of making both color and black and white images is that I’m able to show you more photos here than perhaps I would if they’d all been rendered the same way.